How does the name Kannan Devan sound to you? Would you ever associate it with the name of a hill? But as the legend goes that when the British first visited Munnar, it was two Mudhuvan tribesmen who took responsibility to show them around. They were inhabitants of the hills itself and thus could show the British around with confidence. It was these two tour guides who were named Kanan and Devan, after whom the hill has been named. It is located in the Idukki district of the Indian state of Kerala. It was later given on lease to John Daniel Munroe, of London and Peermedu, for tea plantation. Something else to feel proud about is that The Kanan Devan Hills Plantations Company is one of the first companies where all of the employees are shareholders. It overtook Tata Tea Limited on the 1st of April, 2005 and comprises seven tea gardens covering an area of 24000 hectares. By Road: Kannan Devan Hills Bus Stand is the bus stop available locally but the frequency of buses is limited. The nearest major bus station is Ernakulam KSRTC Bus Stand. Travelling from Kochi to Kanna Devan Hills shall take 4 h by road. Similarly, from Coimbatore also it is 148 km. It takes around 5 h from Madurai. By Rail: If you travel by train, Palakkad Junction Railway Station is the nearest. Another train station nearby is the Theni Railway Station. By Air: Cochin International Airport is the major international airport. If we speculate about places to see here, then definitely we shall chance upon exciting tourist places of attraction. Let us explore a few together! A part of the UNESCO World Heritage Sites, this is Kerala's first national park which is the sacred home of the Nilgir Tahr. It is specifically located in the Devikulam Taluk of Idukki district and now when animals are quickly becoming extinct, this park is a boon for the animal. A place for it to feel safe. Another interesting thing about the park is the exotic Neelakurinji flowers that blossom only once in 12 years. The southern area of the park comprises South India's highest peak, Anamudi(2695 m) and this 97 square-kilometres place promises a lot of fun. Echo Point is also quite famous and people flock to it in large numbers. You have numerous options for trekking as well but there are also two places not accessible to the public and you might wonder why! Namely, Core Area and Buffer Area. The park houses a lot of enthralling flora and fauna to captivate your interest. You shall never be bored if you get to view rare terrestrial and epiphytic orchids and beautiful wild balsams along with the Nilgiri Langur, leopards and the Indian Bison. An official vehicle shall fill your heart with enthusiasm as it takes you on a smooth ride to view the shola-grassland at a height. When it is the beginning of the year, the Tahrs take to calving and thus the park remains closed. Otherwise, it is accessible all throughout the year. This hill station at an elevation of 1700 m is about 13 km away from Munnar and shall make you feel magical. Cradled in the green valley, Mattupetty Dam and Mattupetty Lake are the ones which play a major role in water conservation and generation of power. Also known as the 'cattle village', you can experience hundreds of varieties of high yielding cattle which freely graze in the fields and will give you a sense of joy seeing the free spirits. Easily accessible from the Munnar town, this place is usually frequented by the tourists from the months of May to August. You can enjoy the serene atmosphere of Nature while you participate in water activities like speed boating organized by the District Tourism Promotion Council of Idukki. The beautiful dam enchants each one and instigates the adventure buffs to enjoy trekking in the forest of Shola. Bordered by tea gardens, Shola forest and hilly terrains, there lies a mesmerizing lake which is not very far away from the dam. The Mattupetty lake shall transfer you to a world of tranquillity. You can either opt for boating in the lake or just spend some time by the shore peacefully. What would you prefer? Speedboat, motorboat or rowboat? Take your pick! Located at a height of 2600 m, this is the second highest mountain of the Western Ghats. To reach this natural paradise, you have to put on your trekking shoes for at least 6 h. If you have the thirst to wave the flag of victory on the top of the world, then this is a golden opportunity. The scenic view in Munnar, Idukki is exemplary and the thrilling mountain-climb shall give you an adrenaline rush. It is a fun challenge for the adventure lovers and reaching the peak shall definitely make you feel that it was worth it! Meesapulimala peak shall also give you access to to the extensive view of the Tamil Nadu and Kerala borders. You can also go to Meesapulimala via Kurangini which takes about 9 h. This is more time consuming as it around 15 km. 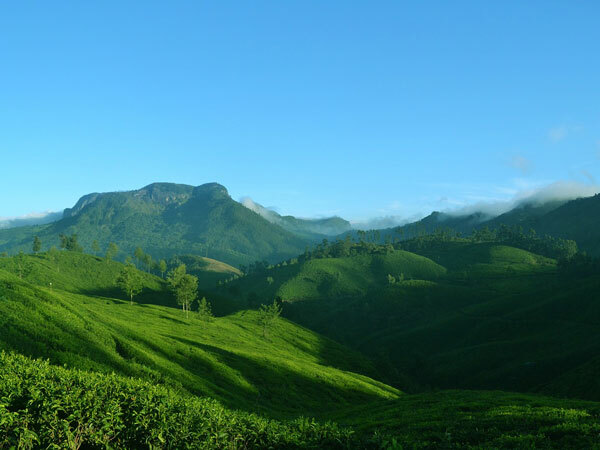 Soon, the Kolukkumalai tea estates emerge and allow you to take a break and seep in the breathtaking views. The green meadows and lush Shola forests are exhilarating. Meesapulimala trekking is quite popular among the people and so make sure that you do not miss it! Heard about the Great Grizzled Squirrel of India? The Chinnar Wildlife Sanctuary in Idukki is its sheltered cosy home. It is counted among the most endangered species. Due to its location in the Western Ghats, it receives less than 2 months of rainfall and a little credit given to the wildlife, the place is perfect for the trekking fanatics. The amazing sandalwood forest nearby is also quite attractive. It is a diverse grassland with a variety of medicinal plants as well as flocking on the roadside you can find spotted deer, Sambar, Hanuman Langur and peacocks. It is also well-known for its eco-tourism activities which include river trekking, trekking to the cultural site, nature trail to the watchtower, trek to the Thoovanam Falls, interpretation activities and medicinal garden, tree house at Chinnar and camping at Vasyappara. Enough to trigger your travel spirit to visit the Kannan Devan hills!